Smart Choice Driving School has been operating in the Durham and Northumberland Regions for nearly 20 years. We pride ourselves on being active in our communities and support a wide array of community initiatives. We provide a bursary for a graduating student at both St. Mary's and CCI. We offer classes at the Best Western Hotel and St. Mary's Catholic Secondary School in Cobourg. Our classroom sessions are fun. Seriously…ask around. Our in vehicle training is geared towards getting a license but also helping you to drive defensively. We sponsor the Oshawa Kicks Soccer Club, and routinely contribute to various other local programs. Ask the other driving schools how they contribute to your community. We provide an annual bursary to a St. Mary’s graduating student and I will forever contribute to one of my former students who actively participates in Cystic Fibrosis fundraising events. We understand that everyone is looking for a bargain and frankly we believe that we offer just that. We offer an MTO approved beginner drivers education(BDE) curriculum as does every other approved driving school in Ontario. So I Guess the Question is Why Choose Smart Choice Driving School? Our experience and personal touch make us the Smart Choice. 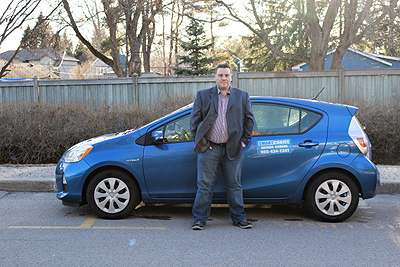 Jon Gale: instructing since 2013 in Cobourg, Bowmanville, and Oshawa. However, couple that with 29 years as a teacher, department head, coach and mentor with the Kawartha Pineridge School Board and you have an individual whose devotion to education is unparalleled. On a personal note; Jon Gale was a coach of mine during my high school years. Any time as a business owner you find somebody with the pedigree of a Jon Gale, you bring that person on board immediately. The fact that I trust him and respect him doesn’t hurt either. Richard Jenkins: Instructing since 2000 in the car and the classroom has given me a unique perspective on this industry. Helping people learn to drive and get a drivers license is incredibly rewarding. The beauty of this industry is that I get an instant sense of satisfaction. Over the years I have helped thousands of people gain the independence that comes with driving. I have helped people get their dream job. I have helped people overcome fears after everyone else in their life has told them they would never drive. I have helped parents learn to drive their kids to soccer. I have helped teenagers prove to their parents that they can be trusted. It’s actually pretty great to help people learn a skill that means so much to their everyday lives and continues to matter for a very long time.